Tajikistan is a country that you might have to look at a map to locate, it's a small country situated on the Afghan northern border. A landlocked country, 90 percent of Tajikistan's surface is covered by mountains; with Kyrgyzstan to the North, China to the east, Afghanistan and Pakistan to the South, and Uzbekistan to the west. Tajikistan suffered severely from a bloody civil war from 1992-97, creating a vacuum where conditions were perfect for lawlessness to fester; a perfect trade route to export Afghan opium for heroin production around the world. The ultimate goal for drug traffickers in Afghanistan is to transport their drugs to Russia and then on to the Western European markets. Traffickers have found a better route than Tajikistan for moving their product - Iran has become the channel to move the world's heroin. Russia, with a population of 142 million, is a large market for Afghan heroin and is a key stop in the bridging of Afghanistan with the European drug market. An increase in stability has developed in Northern Afghanistan, making it very difficult to smuggle drugs into Tajikistan finding alternative routes is the natural course when ever obstructed. "The amount of drugs seized (in Tajikistan) in 2009 is noticeably smaller than in 2008", said Rustam Nazarov to Reuters, who is the head of Tajikistan's state Drug Control Agency, adding that some 4.5 tons of illicit drugs were intercepted in 2009. Afghanistan produces more opium than any other country and the world has a vested interest in stopping the flow of traffic; Tajikistan claims that they seize two-thirds of the drugs moving through the country; however, the number is believed to be much lower - around one-tenth of all the opium being smuggled is seized. The United States and several other NATO allies have been trying to urge Afghani farmers to grow other cash crops like wheat. A very difficult task when you factor how long the farmers in that region have been cultivating opium poppies. "Last year, the United States spent about $300 million on agriculture projects there and projected spending this year is more than $425 million, not including separate funds from U.S. military coffers handed out by troops in the field", reports Reuters. A lot of money but will it be enough to stop the flow? At the end of the day you would think that one country is happier, Tajikistan; the less smuggling that occurs would create more stability. 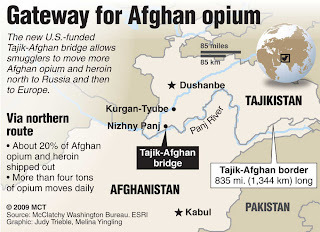 The new U.S. funded Tajik-Afghan bridge makes Tajikistan still a viable trafficking option even if the amount crossing the border is reduced, heroin will still find its way to Russia via Tajikistan. Unfortunately, the stability of the entire region is contingent upon Afghanistan and their opium production. "Unfortunately the drugs situation in our country and the region as a whole solely depends on the situation in Afghanistan," Nazarov said to Reuters. "Only when there is law and order in Afghanistan there will be law and order in our country."